How Do I Delete Multiple Emails When I Have a Lot to Delete? - Ask Leo! It can be a challenge to delete multiple emails. I'll look at some of the concepts and techniques used by various email programs to make it easier. Two factors determine which it’s going to be: your criteria for which emails you want to delete, and the capabilities of your email program. While I can’t show you what works in every email program or interface, I’ll review a couple of common techniques that will make this easier. Those techniques are useful for more than just deleting email, and they work in arenas other than email as well. Several of the techniques we’ll look at below work best if you maximize the number of emails listed on your screen at one time. Not all email programs or services give you this control (most notably Outlook.com as of this writing), but many do (like Gmail). Maximum page-size setting in Google Mail. Many email programs have similar settings: they control how many messages are listed at once before you have to click to see the next page. When you’re dealing with a lot of messages, it’s nice to be able to have as many on the screen as possible at a time. Check your email program or service to see if that setting is available, and consider setting it to something large. We’ll see in a moment why that’s handy. One of Windows’ basic concepts is selection. Click on something — like a message in a list — and it’s selected (and often highlighted). Also basic is the concept of multiple selection — the ability to select more than one thing at a time. Let’s look at how each works. Click. When you click on an item, any other item in that list or set is de-selected, and the item you’ve clicked on becomes the only item selected. Single item selected as the result of a single click. Two items selected by clicking one, then CTRL-clicking the other. SHIFT-Click. When you shift-click an item, all items from the item currently selected to the item that you click on will be selected. The result is that the first item you click on, and all items in between, are selected. A range of items selected by clicking on the first and then SHIFT-clicking on the last. 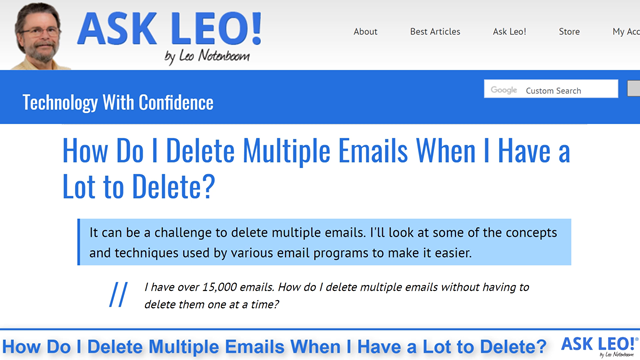 Given these selection techniques, you have three approaches to deleting multiple emails. Click each item and click Delete, one by one. CTRL+click all the items you want to delete, and press Delete to delete them all at once. Or, if the items are all next to each other, click the first item, SHIFT-click the last item, and click Delete to delete those two and everything in between. One handy shortcut: typing CTRL+a means “select all”, and all messages visible in the list would be selected. You can then CTRL-click to unselect specific messages, leaving the remaining selected. Many web-based interfaces don’t use click, CTRL-click, and SHIFT-click the way I’ve described above. Instead, they include a checkbox in front of each item. You can check the checkbox for each item you want to act on, and then click on Delete to delete the checked items. The select-all checkbox in Outlook.com. Click on that, and all the messages displayed will be selected. Note that, again in Outlook.com, the individual message icons have been converted into individual selection checkboxes. The select-all checkbox in Outlook.com with all selected. 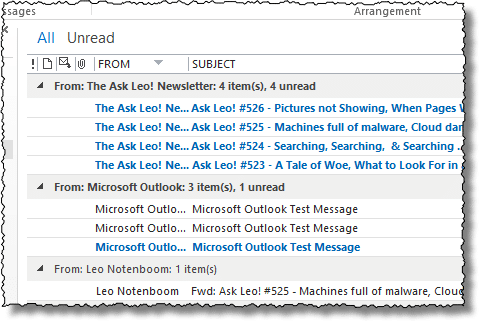 Email sorted by sender in Outlook 2013. Typically, clicking on the header sorts items in one direction, and clicking on it again sorts it in the other. 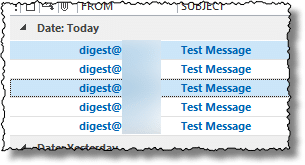 In most cases, any column that can be displayed in an email (or many other) program’s list view can be used to sort the list. Why do I focus on sorting so much? Because it makes what we’re about to do not just easy, but possible. Let’s say you want to delete all email from a particular person. The process combines what I’ve shown you so far. Sort your email list by “From” or “Sender”. Use click and SHIFT-click to select all the emails from that person. If the list of email from that person is short enough to display on a single page, then you’re done. If not, you may need to repeat this a few times, depending on how many messages there are and how many can be displayed per page. Deleting emails from a particular person. Deleting emails to a particular person. Deleting emails before, after, or between two dates. Deleting emails that relate to a specific subject. And probably more, depending on the capabilities of your email program. Move selected emails into a folder. Mark selected emails as read or unread. Flag selected emails in one way or another. And probably more, again depending on the capabilities of your email program. As one might expect from Google, Gmail has a very powerful search interface. That search can be used to automatically select and then act on almost any criteria you can think of. Let’s say you want to delete all the mails from a specific sender. First, search for that sender in Gmail’s search. Searching for all messages from a particular sender in Gmail. Gmail displays all the messages that meet that criteria (up to the number of messages configured to be displayed per page). Gmail search after clicking on the select-all checkbox. The key is that all conversations that match what you search for are selected, even those not displayed on your screen. Click Delete, and they’ll all be deleted. Or click on any other action to apply that action to all the selected messages. This approach can be used for any searchable criteria in Gmail. 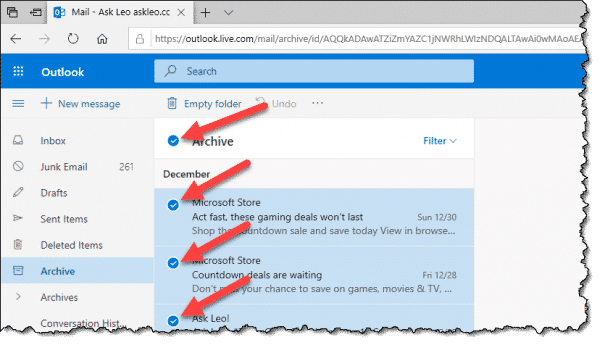 Updated to reflect Outlook.com’s changing interface. Are Deleted Emails Really Deleted? - Depending on what email program or service you use, deleted emails may or may not be really deleted. It's surprisingly hard to tell for certain. When Gmail went to their infamous Primary, Social, etc., is when I had a ton of e-mails pile up as I didn’t understand it at first and unfortunately, I hate to read instructions …. I know … not a good thing for me to do. Now I have thousands, like 20,000 e-mails in Updates, and in one account, even though Promotions isn’t checked, I still get e-mails in Promotions. You can delete a bunch of e-mails IF you don’t go over a certain amount; what that amount is I don’t know. I guess I should start experimenting, but I just hate seeing all those e-mails clogging my account. If I choose to delete 1000 at once, it won’t work, but if I choose 400 or 500, it will, sometimes. If you use Thunderbird as an e-mail client, you’re in luck: There’s an addin (called “Remove Duplicate Messages” that does just that, via a right-click on the target folder. Create a TEMP folder. Scan messages and move the ones you want to read to the Temp folder, where you can read them (or move to a permanent folder) at your leisure. Windows 7: On keyboard, use CTRL A to select all, and hit Delete key, and the rest are all gone. 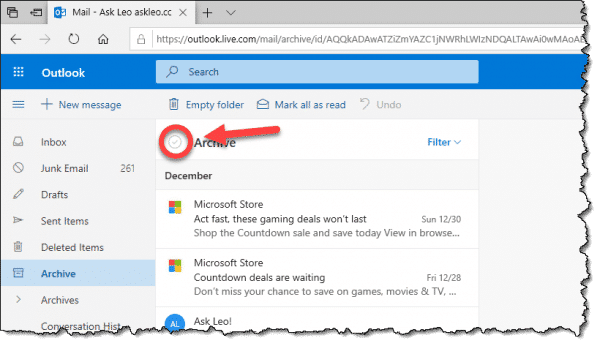 Windows 8.1 or 10: The default Mail app is excellent for this purpose since you can right-click the message you want to save, click Move, and it pops up a list of folders. Also, there is an ALL check box all that works for the Inbox, or any folder (especially good for Junk or Deleted Messages)….check it and then hit delete and they are all removed. There is no ALL check box all that works for the Inbox as you have claimed. We’d be happy if you show us. The Select All checkbox is not available in the main Inbox as it would be unusual for anyone to want to clear everything from there. Sign out every my account address plis.And delet it in every Ask.Leo accountcy.And delet my i am sign out frm Ask.Leo.Dadah. We can’t sign you out from accounts to which you are logged in. You need to do it yourself. If you want to unsubscribe from my newsletters there’s a link at the bottom of every one to do just that. More than that I’m not sure what you’re looking for. I use Outlook online, which I access through Chrome. I have an old hotmail address that I access through the Outlook home/login page and a more recent @outlook.com email address that I access the same way. 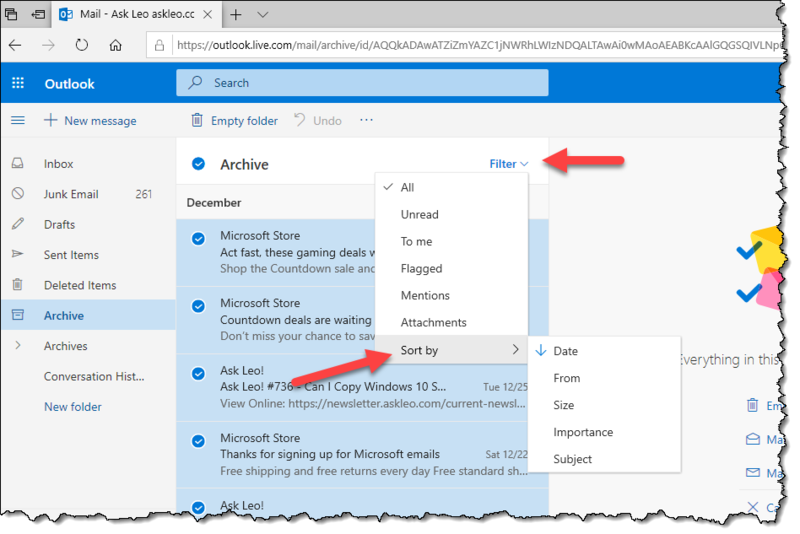 In the hotmail account, I can search for a term, select the top (select all) checkbox and then the “Select everything in this view” link is displayed. Important!! I am in the search results in this case, not just in “inbox” or some other folder. If I try the same thing with my @outlook.com account, I do not get the “Select everything in this view” option when I search for a term and check the top box in the search results list. All it does is select what is visible on the page and I have no option so I need to delete these 15 or so emails and then check the top box again and repeat until all email with that term have been deleted. I have tried the layout settings and everything I could see but nothing does it. I have tried another browser (Edge) but results are the same. I deleted temp files etc…. in short, I did all the first steps troubleshooting but still the two accounts behave differently in regards to the possibility of selecting everything in this view. Microsoft rolls out updates and interface changes slowly – so not all accounts have access to the same features. It’s frustrating, I get that, but eventually one account (or the other) should catch up. Does anybody know how to do BATCH deletes on Gmail ANDROID? I was given this Google phone and it forces you to use Gmail, whether you want to or not. So far, if you want to delete multiple e-mails you either have to log into your computer. On my Google phone I have to tap on every STUPID e-mail to get a STUPID check mark which is a GIGANTIC waste of time. My last cell was an AT&T and it BATCHED all of your e-mails by day-received. So if I received 75 e-mails all I needed to do was click on the day, like “Tuesday”, and it would highlight all 75 STUPID e-mails for deletion. I could then just find the 2 or 3 NON-STUPID e-mails that I want to keep, and then BAM!, 72 e-mails deleted. Unfortunately, with this Android GMail that I am FORCED to use by my Google phone I have to go click on all 72 STUPID e-mails one at a lime. Any way to fix that? Another DUMB thing in this STUPID Android Gmail piece of GARBAGE is that every time I bring up Gmail, it ONLY displays my STUPID Gmail account. I actually have THREE accounts on my phone and I want it to come up as “All inboxes” by default, but I have to go in and CHANGE this STUPID Gmail GARBAGE every single time. Anybody know how to rectify this ANNOYING stuff? Also, if anybody knows how I could install my good old AT&T mail interface on my stupid Google phone, that would be appreciated. It is really mega-dumb to have to waste all this time deleteing these stupid e-mails one by one. I think you said it yourself: go to your computer and do it there. Some things are simply easier on a “real” computer. There’s NO requirement that you use Gmail. Yes, you need a google account, but no one says you MUST use it for email. There are plenty of other 3rd party email programs available for Android (look in the Play Store), and with those you can configure up whatever accounts you want (including gmail, if you care). Try a few and see if you find one you prefer. Finally … sheesh, if you dislike your Google phone so much, why do you have it? In your shoes, given your obvious intense dislike of the device get something else. There are plenty of options. Some people would rather rant and scream about things that they could easily control if they read things. Why indeed does he have it? Could be, as he said, it was given to him. He may, believe it or not, be unable to afford a different phone. Especially the massively overpriced piece of junk called…. iPhone. Yeah, go ahead and flame me… water off a ducks back. Most counterintuitive electronic device I’ve ever had the misfortune to tangle with. Wife bought an iPad Air because her sister has one. Apart from the cost just finding things is ridiculously complex and not… in… tuitive! OK, rant mode back off. Situation Normal. I think. Anyone know how to select gmail emails (for deletion or whatever) using only KEYSTROKES (no mouse required)? Or CTRL KEY+ARROW KEYS At each line (For selecting SEVERAL UNCONNECTED SINGLE LINES. (REMEMBER TO CLICK NUM LOCK OFF IF ITS ON) so you can use the arrow keys on the number pad to your right. Then hit DELETE BUTTON to move to your TRASH FOLDER. Take out the TRASH the same way using SHIFT+A. Then You can permanently delete your TRASH at your convenience. Hope this helps. Good Luck! I’m not familiar with the iPad, but the App should have an empty trash or recycle bin option. I want to totally delete mail. How? What do you mean by permanently delete mail? The normal way is to to delete the emails. If you use IMAP, which most phones do, you can delete them on your phone and then empty the trash. If you use POP3 then you can go on the website for email account and delete the mails there. If you mean delete the account, that’s different for each account and in most cases, simply ignore the account and it will eventually be closed. AN account you don’t access is as good as closed. This is just what I needed, thanks so much! Last fall I was heavily involved with politics and subscribed to far more than I could keep up with , plus I am bad about deleting. Consequently I was soon at 50,000+ emails and the maximum2GB of inbox space. I have Cox webmail. Cox cannot help me other than show me how to delete about 25 at a time. Unfortunately, more come in and I make little headway. Critical business emails just bounce back to senders and I have no idea what I lost. Is there not a way I can delete all of them and then carry out TRASH once? If you can connect to your email service provider via IMAP, using a program like Thunderbird, you can select all the emails by typing CTRL+A when in the Inbox and clicking the Delete button. Right-click the Trash folder and click Empty Trash. Or if you still want to keep these emails, you can move them to a local folder which keeps them on your computer and removes them from the server. In the future, you might want to move to an email service provider with more storage capacity such as Gmail with 15GB. You can even continue to use your cox.com address and have Google retrieve them for you. That way your cox.com emails will be moved to the Gmail account and remain relatively empty. The simple answer is, of course, yes. But it really depends on exactly what you’re trying to do and what email program you’re running on the iPad, and how it’s configured. For example the difference between deleting the email just on your iPad and on your iPad and everywhere else is critically important, and depending on what you want the answers differ. I use Thunderbird to manage my emails and it ‘displays’ all of your emails in the folder you are looking at. So, if you click CTRL+a, you will select all the emails in that folder. I often use ‘sort by sender’ then click/SHIFT+click combination to select all the emails from that sender and then CTRL+click to select the few emails I want to keep from that sender. I still have AOL [I know, I know]. I used to be able to shift click to delete groups, but it has stopped working. If they don’t fix this or show me an alternative, I may have to grow up and use my G-mail acct. I’ve googled it, but to no avail. I don’t want to pay AOL, so I may soon have to give up. No ISP should be charging anybody for assistance with THEIR email program. Oh, right, its AOL isn’t it? I have about 15000 e mails in my lap top how do I delete them all at once? I’d start by reading the article you are commenting on. Since you don’t specify how you access your emails, I can only give a general answer. If your email program or webmail page has a show unread messages option, select that, then press Crtl+a to select all of the emails in that view and then click on the Delete button. I wish to have a step by step instruction manul on how to delete all unwanted emails at one go except those I want to save on yahoo email? Would appreciate if you could help. It depends on how exactly you decide which are worth keeping. I’m trying to clean out my Gmail (older ones) but when I tap on it and tap on the garbage can, all of them are thrown out. I’m on a rca Android tablet and get easily confused. Is there an easier way to clean out my Gmail without getting rid of them all? Honestly, I’d use the web interface on a desktop or laptop computer. The mobile interface is cumbersome for this kind of thing, in my opinion. If you want them to go to the Windows Recycle Bin on your desktop, you cannot. Email doesn’t work that way. Your email program or interface will have its own Recycle Bin. Exactly how that works, or how to fix it if it’s broken, will depend on what email program or interface you are using.